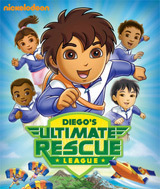 Diego is visiting Rescue Island. It's a super secret island where rescuers come from all over the world to see if they're ready to be World Animal Rescuers! There are lots of different habitats where animals live on the island, and Diego needs your help to return the animals to their correct habitats and earn his World Rescuer patches. Along the way you'll drive numerous rescue vehicles, collect extra patches, and play mini-games to help get the baby animals home. Once you've completed the game you can go back and play any of the locations again to collect more badges and printables. Games feature natural science, audio recognition, matching, and hand/eye coordination. Comments: THIS IS A GREAT GAME FOR KIDS TO PLAY. Comments: This game is for children. I am glad I had the opportunity to check it out. It will be great for the gandkids when they come to visit.